and some setsubun riutals, February 3.
fallen leaves of the holly . A green prickly tree with berries that become red late autumn/fall/early winter. Most associated with Christmas in English-speaking countries, but known in many others. Leaf: Alternate, simple, and persistant, thickened and leathery, eliptical in shape, 2 to 4 inches long, dark green and shiny above, pale green below with entire or spiney-toothed margins. Flower: Dioecious, dull green-white, male flowers on 3 to 7 flowered cymes, female flowers are solitary with a pleasant odor. Flowers apparent April to June. Fruit: A berrylike drupe, red, rarely yellow when ripe, 1/4 inch in diameter, containing ribbed nutlets. Maturing September to October, persisting on tree into winter. Twig: Slender with rust-colored pubescence. Bark: Light gray, with prominent warts. Form: A small tree, with a thick crown and pyramidal form, usually with branches to the ground. For most of us the sight of holly leaves and berries is inextricably linked with Christmas, whether we celebrate this as a secular or a religious festivity. Christmas brings with it many traditions and it is probably the one time when many of us still practice at least a few old folklore customs today. Indeed in some parts of Britain holly was formerly referred to merely as Christmas, and in pre-Victorian times 'Christmas trees' meant holly bushes. Holly was also brought into the house variously to protect the home from malevolent faeries or to allow faeries to shelter in the home without friction between them and the human occupants. Whichever of prickly-leaved or smooth-leaved holly was brought into the house first dictated whether the husband or wife respectively were to rule the household for the coming year. In Celtic mythology the Holly King was said to rule over the half of the year from the summer to the winter solstice, at which time the Oak King defeated the Holly King to rule for the time until the summer solstice again. These two aspects of the Nature god were later incorporated into Mummers' plays traditionally performed around Yuletide. The Holly King was depicted as a powerful giant of a man covered in holly leaves and branches, and wielding a holly bush as a club. He may well have been the same archetype on which the Green Knight of Arthurian legend was based, and to whose challenge Gawain rose during the Round Table's Christmas celebrations. In addition to being associated with the Sun God (Saturn) in ancient Rome, holly was important in Pagan/Druidic religion and customs. Under many Pagan religions, it was customary to place holly leaves and branches around their dwellings during winter. This was intended as a kindly and hospitable gesture; they believed that the tiny fairies which inhabited the forests could come into their homes and use the holly as shelter against the cold. This may actually have had some basis in fact, as holly growing in the wild is often used as shelter by small animals, primarily insects. Native Americans used wood from the American holly for many uses and the berries were used for bartering and decorating. The American holly was also a favorite of George Washington's and he planted many throughout his properties. Wood from American holly trees is still used today in woodworking projects, most often for decorative inlays in cabinetry. The American holly is an pyramid-shaped evergreen that can grow to be 40-50 feet in height but often the trees are pruned to serve as attractive hedges. These slow-growing trees develop small white flowers in late spring and bear bright-red berries in fall that last throughout the winter. However, the berries only grow on female American holly trees and the male trees must be nearby to pollinate the female's flowers and ensure fruiting. commonly known as Yaupon or Yaupon Holly, is a species of holly that is native to southeastern North America. The word yaupon was derived from its Catawban name, yopún, which is a diminutive form of the word yop, meaning "tree". 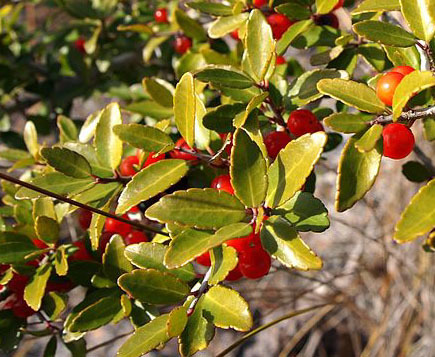 Another common name, Cassina, was borrowed from the Timucua language (despite this, it usually refers to Ilex cassine). Native Americans used the leaves and stems to brew a tea, commonly thought to be called asi or black drink for male-only purification and unity rituals. The ceremony included vomiting, and Europeans incorrectly believed that it was Ilex vomitoria that caused it (hence the Latin name). The active ingredients are actually caffeine and theobromine, and the vomiting was either learned or as a result of the great quantities in which they drank the beverage coupled with fasting. Others believe the Europeans improperly assumed the black drink to be the tea made from Ilex vomitoria when it was likely an entirely different drink made from various roots and herbs and did have emetic properties. Dedicated to those born on November 1. Also a Symbol of Wisdom.